A much plainer offering than Brians, but I hope you find it interesting all the same. The photos do not express the contrast so well - sorry. 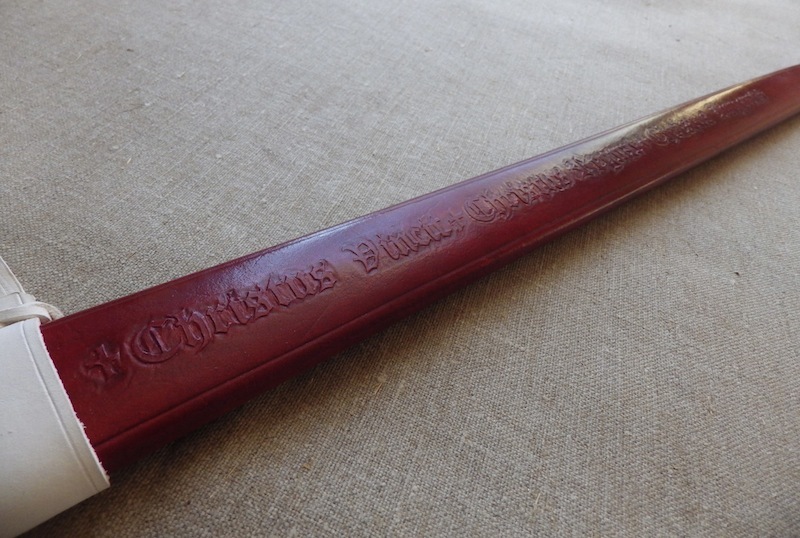 This is as usual a poplar cored, leather covered scabbard dated to the mid 13thC. 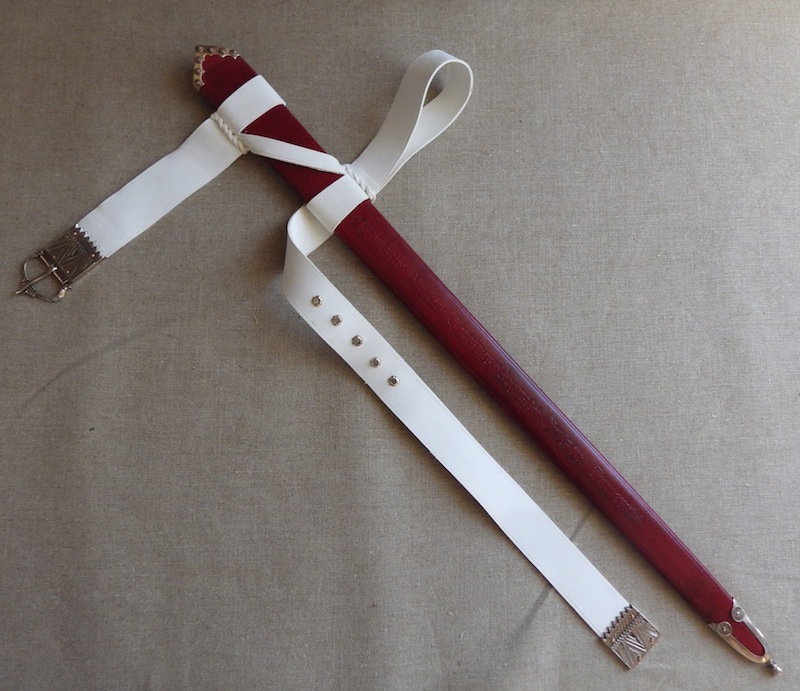 The throat has a metal rainflap detail as is often seen in the effigies and the harness is 'King Sancho' style made in alum tawed leather giving a pure white matte finish. I have no idea how the customer plans to keep this white, but I did warn him it wouldn't be easy. Much easier in the old days when you just had your servant worry about that. Making these is a pain as every time you touch a tool you have to change your gloves. 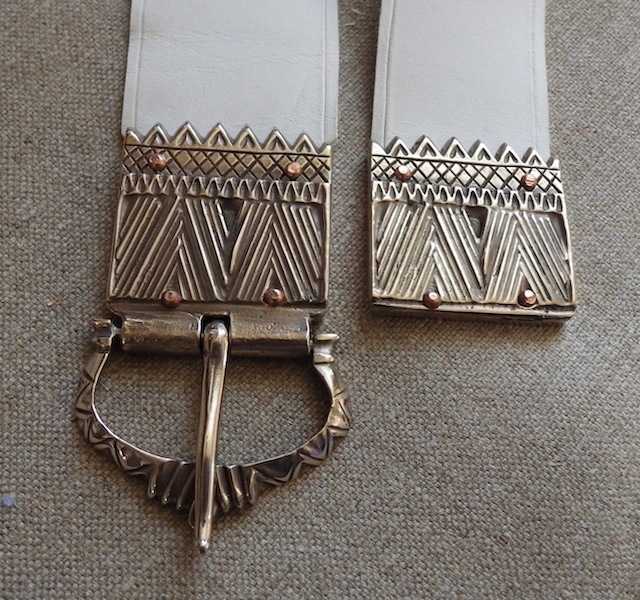 Although the metal rainflap adornment was custom made for this, the chape and buckle set are from Tods Foundry (though the buckle is not yet on the site). I have a friend called Lisa working for me now helping with the leatherwork and although I think she is good, I think this has come out particularly well and I hope you like it. A very interesting color combination for sure. I REALLY like the way you have the leather cord twisted where it is squeezing the belts on to the scabbard (sorry, don't know that technical term for that part). I think it looks great. Thanks for sharing. Could you give us a closer shot of the locket? -- I can't tell for sure, but the metalwork looks like it is a reflection of the pommel shape. It may not stay white for long, but at least for the time being that is a very regal looking piece. Looks like something right out of a manuscript. Beautiful work, Tod. 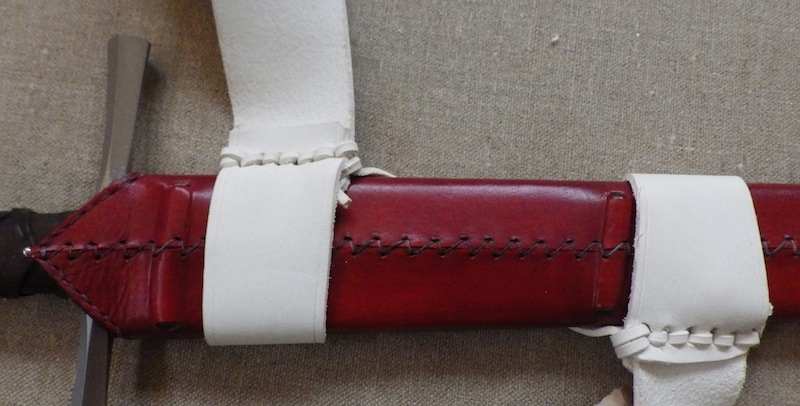 Looks as off the belt and divider are cut from one piece of leather? Any chance we could see a shot of the back of the scabbard? Yeah I have agree that a white belt ain't likely not very practical for a solder gear, but man it does look amazing (superb color contrast). Would there be a way to coat/finish the leather with some kind of heavy duty mate varnish to minimize this issue? I'm not too keen on the writings down the length of the scabbard (never seen this documented - though this is a firmly established modern trend) but it's very well executed (nice work Lisa!). I also like your take on the belt lacing, very neat. Did your customer specify the white belt color? If so, is he an SCA Knight (thus explaining the white color)? I’m always excited to see you start a new topic as it means there’s eye candy within! Thanks everyone, I appreciate the compliments and will pass them on to Lisa who made this one for me. The buckle side of the belt is as one with the 'Z' and the bottom horizontal of the Z is laced to the longer side of the belt. I am away for a couple of days, but will post pics when I return. Again I will post up some pics in a coupe of days, but yes they do reflect the pommel quite well. Looks like something right out of a manuscript. He may well be SCA, but I think his motivation was following manuscript pictures. 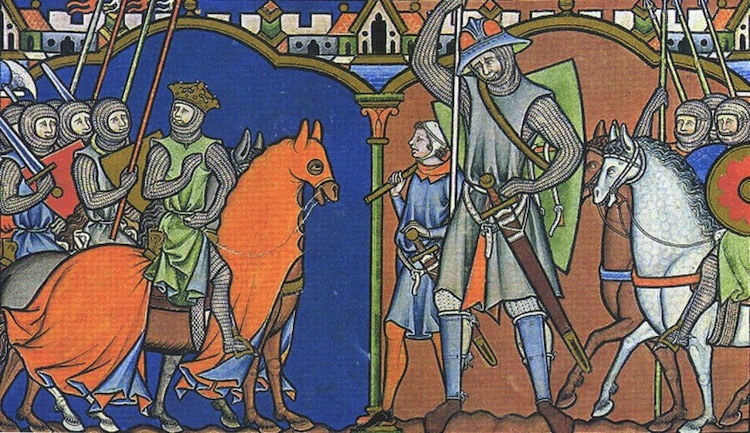 White belts are often depicted for knights in the 13thC and he just wanted to reflect that. As I always do, I point out the difficulty of living with white suede and ocassionally someone jumps right in anyway. The picture below is from the Maciejowski Bible. I'll second what Tod says about white belts. They're actually quite common in the Middle Ages, and seem to first appear in the 12th century. In fact, they're one of the most common belt colours found in manuscripts in the second half of the 12th century, and they persist throughout the thirteenth century and at least into the fourteenth century. I can't speak for the 15th century, but I imagine that white belts can still be found then as well. Tod, this is a superb scabbard. I was literally just looking at the King Sancho scabbard last night in Records, so it's quite a pleasant surprise to see you've posted one here today. Like Julien, I'm not keen on the text as well, for the same reasons, but that does nothing to detract from your outstanding work. I particularly like the chape and locket. Beautiful work! 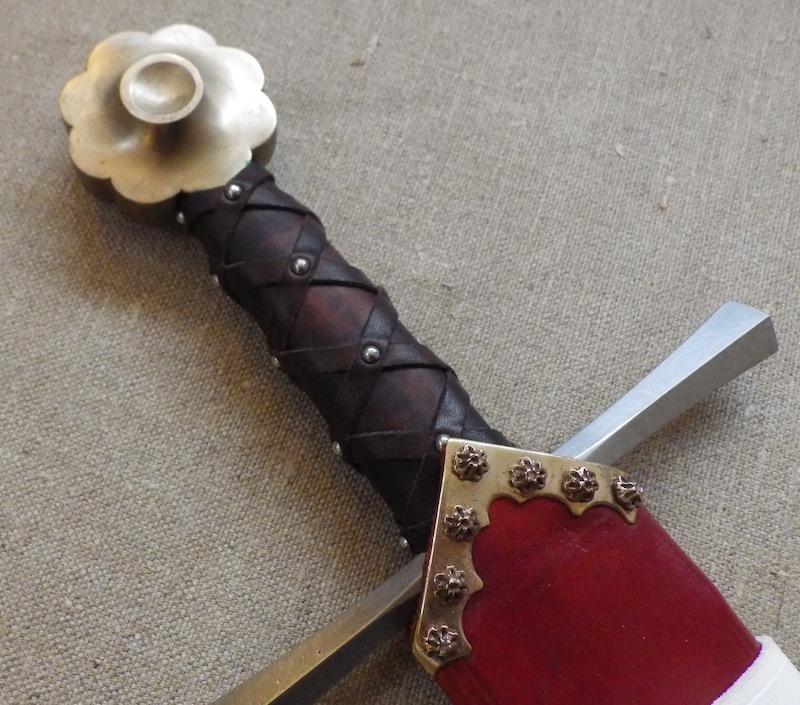 I really think you capture the proper medieval aesthetic like no one else when it comes to scabbard design. Bravo! I just want to second what Ian said ... it's easy to get distracted by ornamentation and decoration, but I'm personally far more interested in clean lines, quality of craftsmanship, attention to detail, and historical accuracy ... all things that Tod is well-known - and well-respected - for. This reminds me of the old story about the man who wants to buy a handmade silver ladle: the merchant shows him two options, one rich and ornate, while the other is plain and simple. Without hesitation, the man chooses the plain one. 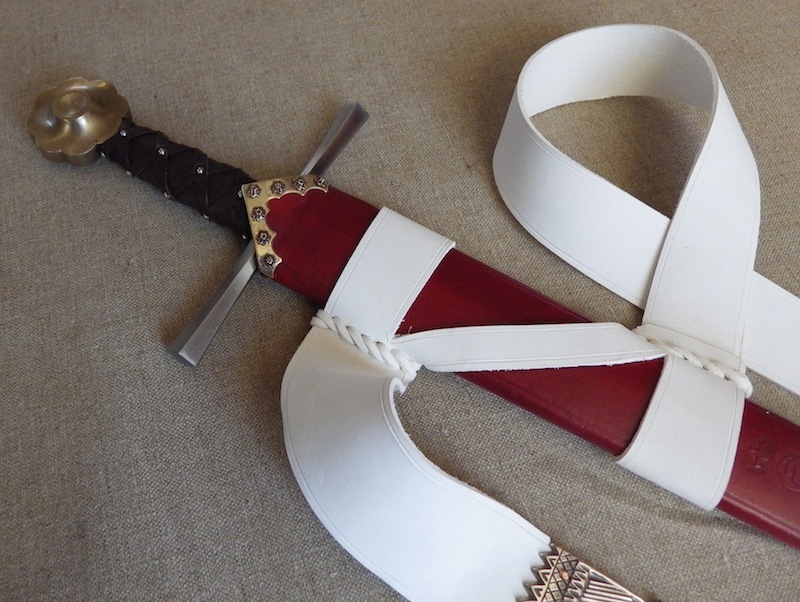 This is not to say that ornamented scabbards can't be lovely too (and all credit to Lisa for her work on this particular one!). But I just wanted to acknowledge Tod's skill in consistently providing our community with incredibly high-quality, functional, well-made scabbards, with ornamentation that accentuates, and doesn't get in the way of, the beauty of the overall form of what he creates. This, to me, is true art. Thanks for the kind words and the support guys. I was asked to post up pictures of the throat and also about how the belt is fixed. Hopefully the pictures of the back will show what you need to know, if not just ask away. Did the metal edging of the rainflap (stunning work, by the way) have a historical inspiration somewhere? Thanks for the pics Tod, very insightful. I did not notice that the belt was not made from a single strap at first. Also I might be wrong but the raisers at he back: did you insert a piece of wood in each to lock the belt in place? If so interesting solution. Great work as always Tod.